1. Reserve 12 of the apricots, roughly chop the remainder and put them in a bowl with the orange zest and juice. Leave to stand for 30 minutes. Line a 12-hole muffin tray with the tulip wrap cases. 2. Preheat the oven to 200°C, gas mark 6. Sift the flour, baking powder and cinnamon into a bowl. Stir in the oats and sugar. Mix together the buttermilk, eggs and butter, and add to the bowl with the steeped apricots and orange juice. Gently stir the ingredients together with a large metal spoon until just combined. 3. Divide among the paper cases. 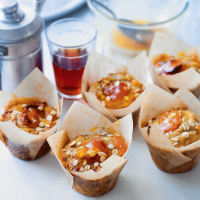 Arrange the reserved apricots on top, sprinkle with extra oats and bake for 18-20 minutes until risen and just firm to the touch. Transfer to a wire rack to cool. 4. Combine the apricot preserve with 1 teaspoon boiling water and spoon over the muffins, best served warm.